907F Alpha Adult Gray Female 6 Uninfected 2013 Junction Butte Pack Only radio-collared pup from the 2013 cohort. Her minor mange infection in late fall 2013 worsened through the 2014 winter, but she has made a full recovery as of March 2015. She pushed her sister, 969F, out of the position of alpha female in 2017 and bred a young male from Prospect Peak (1048M) who joined the pack. 969F Subordinate Adult Gray Female 6 Uninfected 2013 Junction Butte Pack She was seen alone quite a bit in 2015-2016, but as of 2017 she is with the pack. 996M Subordinate Adult Black Male 4 Uninfected 2015 Prospect Peak Pack Originally a Prospect Peak wolf, he joined Junction Butte in March 2017. His collar is not functional. 1047M Alpha Adult Black Male 5 Uninfected 2014 8 Mile Pack This wolf is black with blonde/orange-ish mottled markings. He attempted to disperse with the other males that left Prospect for Junction Butte in March 2017, but was unsuccessful. He wandered, often seen with Prospect Peak in 2015, and then joined Junction Butte in March 2017. 1047M has a noticeable limp; he typically lags behind the rest of the pack although is able to maintain his position as alpha male. 1048M Subordinate Adult Black Male 4 Uninfected 2015 8 Mile Pack Originally an 8 Mile wolf, then Prospect Peak during 2016, this feisty male left Prospect in March 2017 and bred 907F, the alpha female of Junction Butte at the time. 1109F Subordinate Adult Black Female 4 Uninfected 2015 Born in 2015 or 2016, this wolf joined Junction Butte Pack in spring 2017. She is a light black color and had a limp for most of 2017 - earning her the title "Limper" for many months; she was collared in December 2017 and is now referred to as 1109F. No ID yet Subordinate Adult Black Male ? Uninfected Limping badly on his front right leg, this wolf joined Junction Butte Pack in August 2017. His origins are currently unknown. 869M Subordinate Unknown Gray Male 7 Uninfected 2012 Junction Butte Pack 869M had severe hair loss over most of his body due to mange infection during the 2012/2013 winter. By April 2014 he appears mange-free. Last location was May 1, 2014 and he may be showing dispersal behavior. 870F Unknown Gray Female 11 Uninfected 2008 2015 Birth year is 2008 or 2009. 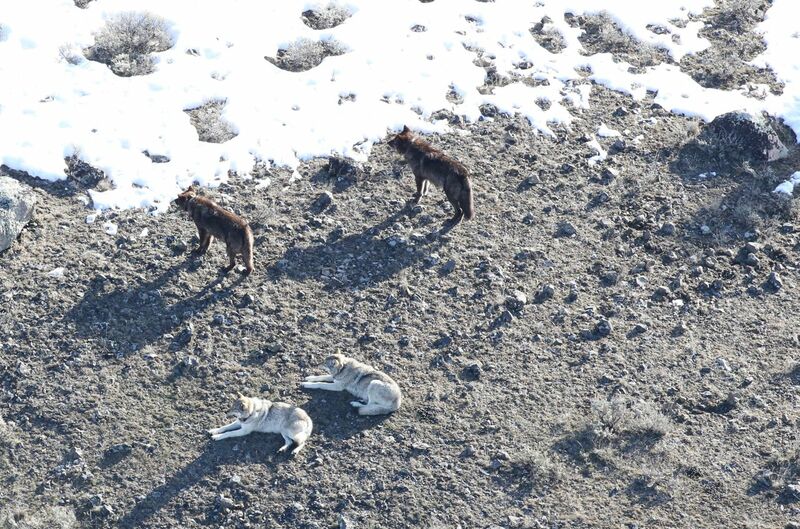 During the 2012/2013 breeding season 870F was injured an lost her position as alpha female of the Junction Butte pack. Later in 2013, she traveled with her neck pointed down, as if she is always smelling the ground. In November 2013 she seemed healed and regained her alpha status within the pack. She denned in 2014 but the number of pups is unknown. During the winter of 2014/2015, she was largely alone. 870F was found dead in March 2015. 889F Unknown Black Female 8 Uninfected 2011 2014 She was radio-collared as a Junction Butte wolf in winter 2013 and denned unsuccessfully in 2013 as a pair with 890M. During Fall 2013, she traveled with 755M but they also failed to den in 2014. She was harvested during the 2014 wolf hunt. 890M Alpha Unknown Black Male 8 Uninfected 2011 This wolf was nicknamed "Patch" before he was radio-collared because of the pattern of hair loss due to his mange infection, from which he has recovered. He left Junction Butte and joined Mollies in summer 2016. His collar is no longer functional. 911M Alpha Unknown Gray Male 9 Uninfected 2010 2016 Birth year 2010 or 2011. This wolf was with the Blacktail alpha male (778M) from fall 2013 until the 2014 breeding season. Later in the winter he was with 755M, 889F, and a black adult female from the Junction Butte pack. During the 2014 denning season, he and the Junction Butte black adult female re-joined the Junction Butte pack. He previously had mange but appears to have recovered. He was killed in September 2016 by Prospect Peak wolves. 994M Subordinate Unknown Gray Male 4 2015 He has not been seen since late 2016, most likely dispersed. New Male Subordinate Unknown Gray Male ? Puff Alpha Unknown Gray Male ? Infected Classic gray coloration. Only adult gray uncollared male other than "New Male". Smaller than "New Male" who was with the pack often in 2013.